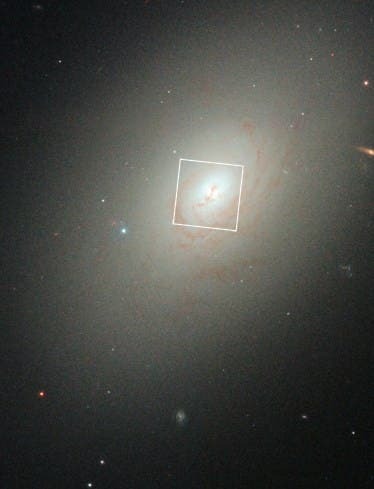 These images, taken with NASA's Hubble Space Telescope, reveal fresh star birth in the ancient elliptical galaxy NGC 4150, located about 44 million light-years away. Elliptical galaxies were once thought to be grave yard of aging stars whose star-making heyday was billions of years ago. The new finding helps bolster the emerging view that most elliptical galaxies have young stars, bringing new life to old galaxies. 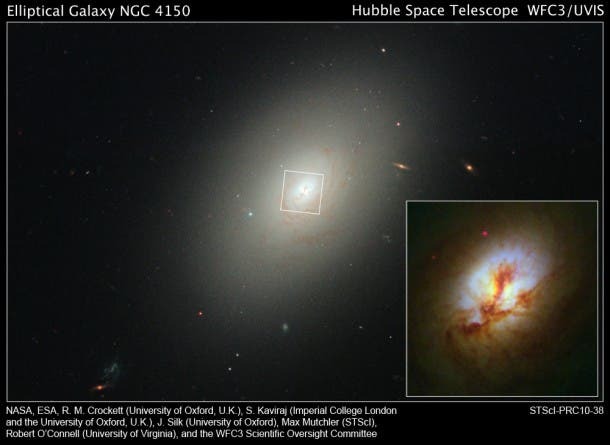 But new observations with NASA's Hubble Space Telescope are helping to show that elliptical galaxies still have some youthful vigor left, thanks to encounters with smaller galaxies. "We believe that a merger with a small, gas-rich galaxy around one billion years ago supplied NGC 4150 with the fuel necessary to form new stars," says team member Sugata Kaviraj of the Imperial College London and the University of Oxford. "The abundance of 'metals'—elements heavier than hydrogen and helium—in the young stars is very low, suggesting the galaxy that merged with NGC 4150 was also metal-poor. This points towards a small, dwarf galaxy, around one-twentieth the mass of NGC 4150."